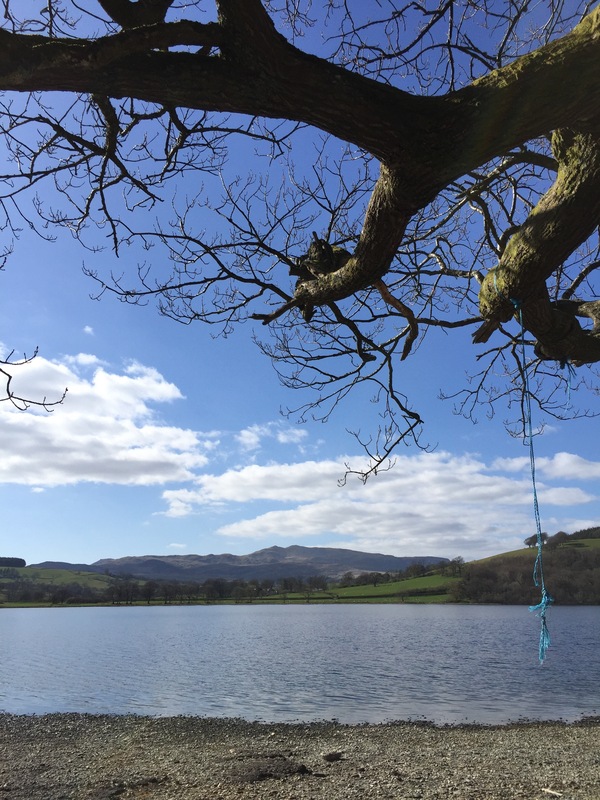 There is a magic about Llyn Tegid and the landscape of Ceridwen’s tale that I can not deny, it holds me enthralled and calls me to visit both the tale and the place time and again. This year North Wales will have to deal with me for at least seven visits as I will be back and forth for most of the year. 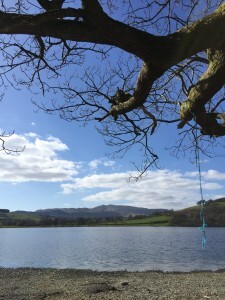 I have already spent a few days with fabulous friends in Bala just a week ago, in a couple of weeks Damh and I will be having a working holiday based in Bala again, I am finally signed on to do the Anglsey Druid Order’s course and will be going to their Bala camp. So the oath I made to Ceridwen on the shores of the lake last year, not knowing what that would manifest in my life, has turned into a pull to spend as much time in various parts of North Wales and Anglsey as I can manage. It is bringing me to a journey of renewed exploration and understanding of my own spiritual path and practise. For too long I felt withdrawn and restricted by physical infirmatey that sapped much of my active spirituality. I have always found that my spirit is best renewed when in the embrace of the diverse landscapes of this amazing set of island jewels that I call home, but now I am able to move reletively freely again I am ready and eager to get out and about. I feel the call of so many great mysteries that are embedded within our folktales that are intimately bound up with the landscapes giving them voice; miraculously there are many that have survived across these islands. The old stories do not sleep, they continue to sing out with deep voices that touch our souls and they will not rest until we fully reclaim our heritage, embrace the incredible journey of this land as a whole and allow it to be re-enchanted. I have no polite words for the Tory government that spread the heresy that “studying Art subjects in schools will hold back a child’s career prospects”. I think nothing could be further from the truth, it is creative thinking that brought us on this long journey from Africa to where we stand now, good and bad though it may be, and it is creative thinking, as well as a remembrance of our history and the errors we have made, that will save the day. The artless automata for big business have done their best to wipe out the creative nature that is our heritage and have turned much of the good into bad; if you ask me they need a good kick up their collective historical and modern fundiments for that disservice to our land/world and all the life that lives on it…. ooops, the soapbox and megaphone snuck out again and I digress, quietly drops the megaphone, steps off the soapbox and pushes them back both back under the table. So I am happily destined to spend this year at least, immersed in many of the tales of Britain and her sister Islands, re-exploring and diving deeper into their mysteries and finding a way to bring any pearls of wisdom I might recieve from the otherworldly cauldron back into this world. I am not initially looking for a scholarly perspective on these myths, though looking at the evolution of stories is a great part of the journey, instead I am looking at and listening to the land itself for my clues. I stand open to interpret the thoughts and feelings I receive from engaging the landscapes and trying to understand it in relation to modern living. This is the main thrust of my spiritual journey and shapes how I project myself into the world. For me it is an intuative and bardic way to drop the barriers of time and space; over the years this method has lead to many startling confirmations when I follow up with the scholoarly aspects. I will ask you to stick with me for a moment as I make another digression; for some reason this train of thought has thrown me into contemplating how I was given my magical working name and I feel prompted to share the story. This name was presented during a meditation during my OBOD Ovate initiation in 1998; I had actually been asking the universe to guide me to a new name for a while before this as I had never felt right with my mother given one and, having gone through a lot of changes in my life, I was ready to take a name that was wholely mine. Anyhoo, deep into this meditation Ceridwen came foward and presented me with a name, however ungrateful me did not like the sound of it for everyday usage, it was harsh sounding and not even close to an English name, I was not sure it was even a real word, so I rejected it. I know, not a good thing to do to Ceridwen! It was the only time I have ever seen Ceridwen as a crone and boy was she mad at me, she wagged her gnarly finger at me whilst giving me what for, then gave me the name Cerri (which I took gratefully and made my legal name). However she insisted I use the other as my magical name, suitably chasten, I did just that. It took me many years to find out the meaning of my magical name, but thanks to Kristopher Hughes revelling its meaning and Tom Thomas in Australia independantly confirming the same, both being native Welsh speakers, in the process of revelation and subsequent confirmation of the name and its meaning, any feelings of uncertainty I might have harboured over the years i.e. that my connection to Ceridwen was just imagined, were utterly put to bed. Without reserve she has had me as a dedicated follower all these years and as I write this I feel she has no intention of allowing me to be slack ever again, infirmities or no. There is and always will be a debate about what the gods are: are they anthropromorphic aspects of the land, our inner dialogue, aspects of one great entity? Entities in their own right? Who will ever know for sure? I am not happy to confine the gods to one form or another, my feeling is that they are whatever we need them to be, all of the above and so much more. They are not truly definable, but for me they are tangible, utterly real in a miriad of ways and I am grateful to feel a connection to something other than the modern mundane existance which lacks any real context without them. It seems I am also going to re-visit other related aspects that have been dormant for a while, but more of that anon. For now I look forward to a holiday with Damh and Oscar the dog, roaming the wilds of North Wales, visiting places associated with the Mabinogi and listening to the voice of the land and what is has to say. Well done Cerri, I so enjoyed this piece. I would love to go on that journey. I look forward to the continuation of your adventures and communing with Mother Earth and to what gems you come across….enjoy!